What connects Shiite passion plays with Brechts drama? Which of Goethes poems were inspired by the Quran? How can Ibn Arabis theology of sighs explain the plays of Heinrich von Kleist? And why did the Persian author Sadeq Hedayat identify with the Prague Jew Franz Kafka? One who knows himself and others will here too understand: Orient and Occident are no longer separable: in this new book, the critically acclaimed author and scholar Navid Kermani takes Goethe at his word. He reads the Quran as a poetic text, opens Eastern literature to Western readers, unveils the mystical dimension in the works of Goethe and Kleist, and deciphers the political implications of theatre, from Shakespeare to Lessing to Brecht. 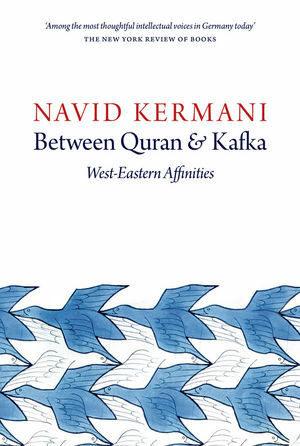 Drawing striking comparisons between diverse literary traditions and cultures, Kermani argues for a literary cosmopolitanism that is opposed to all those who would play religions and cultures against one another, isolating them from one another by force. Between Quran and Kafka concludes with Kermanis speech on receiving Germanys highest literary prize, an impassioned plea for greater fraternity in the face of the tyranny and terrorism of Islamic State. Kermanis personal assimilation of the classics gives his work that topical urgency that distinguishes universal literature when it speaks to our most intimate feelings. For, of course, love too lies between Quran and Kafka. [It] will be a worthwhile read for anyone who is interested in better understanding the intellectual ties that bridge a social and cultural division that is popularly conceived as being thousands of years wide." "The moral power behind Kermanis extraordinary achievements is scarcely paralleled among all the great figures of German literature." "Through his work Kermani shows us the challenges facing the critical mind today and what it can achieve." "As one of its best-known intellectuals, Kermani represents the new Germany." "Kermani is living proof that, even in the generation after Walser and Habermas, the intellectual has not become obsolete as a public figure. He also attests to the source of this vitality, which comes both from education and from an active participation in the world that he observes." "In the end, Kermanis exquisite book is marked by a refusal of the fundamentalists temptation to let Islams dogma eclipse its aesthetic permeability, and a refusal to let taut entanglements slacken into cultural amnesia. Taken together, these essays give texture to the tapestry of affinities that weaves together the two poles of his heritage  and, perhaps, of ours."